A Colorado expungement is the legal process of legally erasing or destroying criminal records of the offender. The records do not really disappear, but they cannot be accessed unless the court orders an access through a court order under exceptional circumstances. 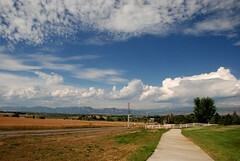 [caption id="" align="alignright" width="240" caption="Colorado Sky (Photo credit: Let Ideas Compete)"] [/caption] Information that can be expunged, if allowed under Colorado state laws, can include information about the persons arrest, detention, trial and disposition. After a DUI expungement it is possible to eliminate any record of the DUI arrest or information about why you were charged. Expunging a criminal record can eliminate not only the embarrassment of the crime but also the negative consequences. Employment agencies, professional licensing agencies, the military and others may no longer have access to your criminal records. You will no longer have to worry about the social penalties, stigma or any other disadvantages of having the DUI arrest on your driving record. If you hire a DUI lawyer to help with your DUI case in some cases they will have the records cleared as part of the dismissal process. Who can have their records expunged in Colorado? Drivers who are found NOT guilty of a DUI may file to have their arrest records expunged. Generally, you must wait one year after you have received the DUI ticket or you have completed the Colorado diversion program. Requests for expungement can be made by completing a variety of forms which can be found online. You may have to file the petition as well as have a hearing. Talk to a DUI lawyer about your options. You will have to have a clean criminal record, and you may have to convince the court that you have been rehabilitated. Juvenile drivers who have been convicted of driving under the influence may also, under certain conditions, may request expungement of their driving records. If you are a juvenile and you have been arrested for DUI it may be possible to have your arrest and conviction expunged and in the eyes of the court it will be as if the offense did not occur. This information may still be available to law enforcement agencies, the district attorney and the Department of Human Services. The information, however, is not available to the general public. Who cannot have their DUI expunged in Colorado? Unfortunately, it is not possible to expunge a DUI criminal conviction in the state of Colorado. There is no statute of limitation. It is important to talk to a DUI lawyer as soon as you are arrested. Colorado DUI lawyers are familiar with the laws of your state and how they can best fight your DUI charges. A well-trained DUI lawyer can hire the right experts to fight the charges. As mentioned above, if you are arrested but not charged or you are acquitted at trial you may have to take very specific steps to have your criminal record expunged. Every state has specific procedures which must be followed to ensure that your actions do not have permanent consequences. Talk to a DUI lawyer for more information.